Steven Adams shoots over DeMar DeRozan during Wednesday's matchup. Adams finished with 10 points and seven rebounds. Russell Westbrook fires the ball over to Nick Collison. Westbrook finished with 22 points and 16 assists. 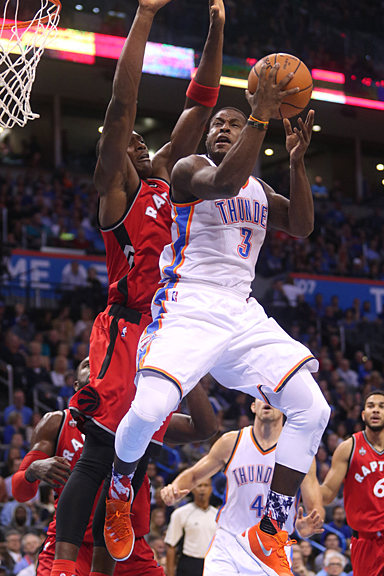 Dion Waiters scores two of his seven points against Toronto. The first-year coach said it himself after Wednesday’s loss to the undefeated Toronto Raptors. Oklahoma City blew a late lead, committed too many turnovers and sent the Raptors to the foul line way too many times. The stat sheet shows the Raptors took advantage of those freebies, nailing 32 of 39 charity shots. By halftime, Oklahoma City had committed 14 turnovers. On several sports radio talk shows, the subject of turnovers has been prevalent. The sports jocks have left no stone unturned trying to solve the problem. Apparently, they couldn’t find a solution either. At least they didn’t share it with the Thunder before Wednesday’s game. Yes, the large number of turnovers is fixable, but it better be fixed soon. The Thunder travels to Chicago Thursday, returns home against Phoenix on Sunday and then travels to Washington two days later. It’s time to fix the kinks. The foul smell that has sent teams to the free throw line needs fixin’, too. Donovan mentioned that issue during the pre-season, yet it still exists. In the second half, the turnovers were reduced substantially, but unnecessary fouls plagued the Thunder. For the game, Oklahoma City committed 29 fouls compared to 16 for Toronto. “They (Toronto) made an enormous number of free throws, but we weren’t able to make baskets or free throws down the stretch,” Donovan said. Outside of those two problems, the Thunder is playing like a team that can win any game on the schedule. After all, the team started off 3-0 with wins against San Antonio, Orlando and Denver. Quite frankly, the Thunder should have beaten Houston earlier this week, but once again, the turnover and foul bug bit hard. And when it bites, it stings in a big way. The two straight losses are evidence of that. But look on the bright side. The team is injury free so far, Kevin Durant and Russell Westbrook are hitting shots for the most part and the explosive Westbrook is playing like the assist king of the NBA. On Wednesday, he had 16 helpers, eight in the first quarter. He’s definitely helping his teammates score, which can only make the Thunder a better team in the long run. Big men Steven Adams and Serge Ibaka are huge shot blockers and a dynamic force on defense. At the same time, Enes Kanter is scoring in double figures on a regular basis and he typically is grabbing double-digit rebounds as well. In addition, Oklahoma City is typically shooting better than its opponents and grabbing more rebounds. On Wednesday, the Thunder had a better shooting percentage but was on the down side of the rebounding numbers, 45-41. Yes, two consecutive losses are a bummer and it stings for the hometown crowd, but it’s early. Five games doeth not a season make.